Bracelet, necklace or both? You decide! Worked in size 10 crochet cotton, little crocheted circles are connected with beaded chains that go to great lengths to make a bold fashion statement. 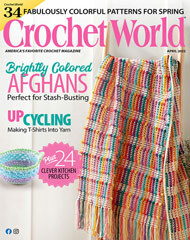 This e-pattern was originally published in the Crochet World special publication Blue Ribbon Crochet. Size: Bracelet: 9" in circumference. Necklace: 34" in circumference. Made with size 10 crochet cotton thread and size 4/2.00 steel hook.